Are there any plans to make Tags easier to add to task ? - Select a task, then Control- or Shift-click onto a tag name? - Drag a task onto a tag name? 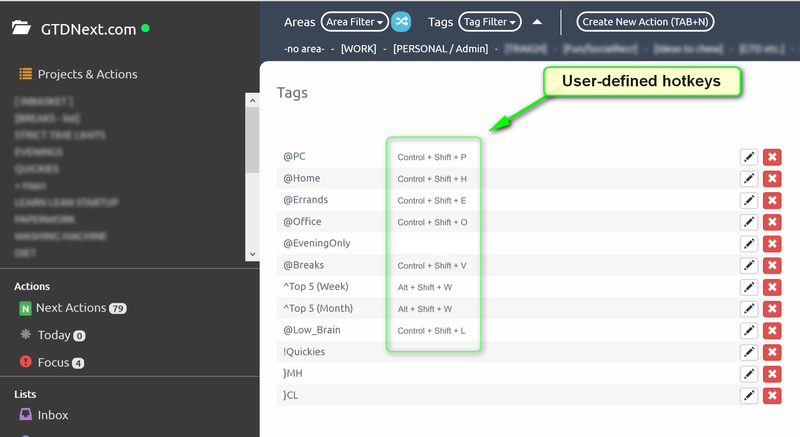 - Drag a tag name onto a task? - User-defined hotkeys for individual tags? I absolutely want to second this! I think you need to provide a way to have the tags shown in the task detail tab so we can just click on them to toggle them on or off for a given task. That way we don't have to start typing the tag and then click it from the list. This current workflow is painful especially when you are blocking out a bunch of tasks that require the same tag. Great to hear that you agree with me! For me personally it's definitely the thing I want most. But how would you suggest that GTDNext actually implement this? I suggest: We click on the triangle to show inline filters and then Shift-click (or control-click or alt-click?) on the Tag you want to add to the current task. Obviously it should toggle on-off with successive clicks. I think that would be a reasonable way to make it work, but I would propose that you have a duplicate of the inline filters, but it would always be shown in the task details area and you would then click on the tag(s) you want to have active for that task. A subsequent click would untoggle the tag. With this implementation, you wouldn't confuse users who are used to the way the inline tag filtering at the top of the screen currently works. I'm not sure if this is what you mean @jweed71, but I suggest it would be great if we could "Paint" a Tag onto our tasks? You do something [not sure what - hit Escape maybe?] to turn the pasting of the Tag off. We are looking at revamping our keyboard shortcuts. We want people to be able to fully use GTDNext on their desktop without ever having to pick up a mouse. What keyboard shortcuts would you like to see us add? What keyboard shortcuts do you use the most that we should keep? What keyboard shortcuts are useless to you that we should remove? What is your preferred way of activating keyboard shortcuts? (must work in a browser) Thanks for your feedback! What I would love to see is like what I have mocked up in the image where created Tags auto populate a region in the task area where a user can just click to toggle them on or off and they change color to indicate if they are on. Yes I hear you @jweed71, and yes, personally I would be fine with that. I think new users would love it too. My slight concern is that you are starting to waste precious screen real estate, and for the more advanced user wouldn't it be a better use of space to use the inline filters at the top of the screen? My suggestion is that the user could hold down a modifier key (e.g. Shift or Control or Shift+Control or Shift+Alt?? etc) and then click on the tag name at the top of the screen. It would be less obvious and thereby have a steeper learning curve but would create a more powerful interface, no? To me, either option would be a BIG improvement. PS As a general principle, for the advanced user it tends to be MUCH faster to enter things just using the keyboard, rather than by mouse. With this in mind what do you make of the idea of adding (& removing) Tags with user-defined hotkeys?